South Yorkshire Fire and Rescue has won a national award for a comms campaign featuring a song about the danger of chip pan fires. The campaign, launched last December to cut the number of house fires over Christmas, won in the ‘best low budget’ category of the Public Sector Communication Awards, held last Wednesday night. It was delivered by a comms team of three on a budget of £70. 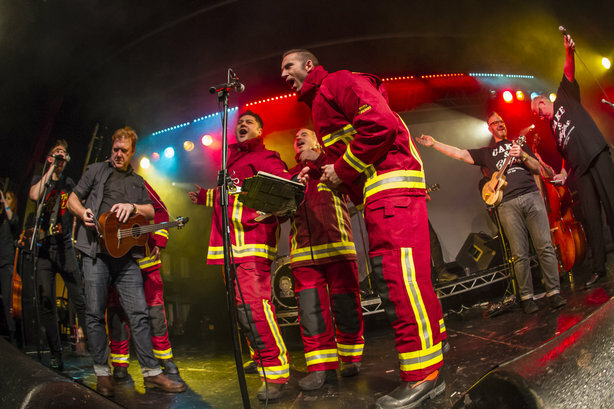 ‘Chip Pan’ features members of South Yorkshire Fire and Rescue‘s Red Watch and 999 operators, together with Sheffield-based band the Everly Pregnant Brothers, performing a song warning the public not to leave their cooking unattended. The band sings: "I thought I were clever. Now me house is on fire and I’m out in’t street. I’m in me pyjamas…." The song aired on television twice and received national and regional newspaper coverage, while the online film received more than five million views across social media platforms. It helped raise awareness of kitchen fire safety among millions of people and contributed to an 18 per cent drop in house fires over the Christmas period in South Yorkshire, to 49, as well as achieving 15th place in the official music charts. Often, those campaigns have tended to rely on negative messaging – emphasising the consequences and dangers of fire. For our campaign we decided to approach it differently. Alex Mills, corporate comms manager at South Yorkshire Fire & Rescue, said: "Fire services have delivered public safety campaigns on the issues of kitchen fires and chip pans for decades, to varying degrees of success. But often, those campaigns have tended to rely on negative messaging – emphasising the consequences and dangers of fire. For our campaign we decided to approach it differently, which resulted in two national television appearances, articles in all of the most-read national newspapers…and the biggest online reaction we have ever seen." Mills added: "Our focus on involving our own staff has also resulted in long-term benefits, further enhancing the reputation of the communication function internally and boosting staff morale."